In the wake of a bad fiscal year, Square Enix wants to further explore the possibilities of mobile gaming. Square Enix had a rough year in 2012, losing more close to $135 million despite a net sales increase of 15.7%. Some would link this loss in part to the company's investment in AAA titles like Tomb Raider which were expensive to make and sold fewer copies than the company expected. Conversely, the publisher found its recent mobile efforts have been growing in profitability and expressed an interest in expanding that area of its business. 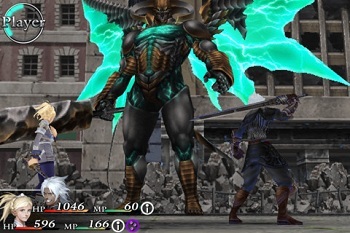 Now Square Enix president Yosuke Matsuda has revealed that in the future the publisher will be releasing a wider breadth of content to mobile devices, including games that might have traditionally been reserved for home console releases. "Moving forward we are thinking to push into publishing games on smart phones and tablets, which we had hitherto only published on game consoles, in particular our strong-point of single player, story-driven games, etc," said Matsuda. "I have already given these instructions to our development teams, and we are moving ahead with this effort. Until now we have published games on these devices such as remakes of our old titles or turning our old franchises into social games, but going forward, in addition to these efforts, we will create new game titles of similar type." While a new focus on mobile gaming will likely have some eyes rolling, this may very well be exactly what the company needs. There may be some who love the publisher's multi-year, massive budget projects, but it's become very clear that that sort of game isn't making the kind of money it used to. Perhaps by tethering the development of console-style titles to the capabilities of mobile devices, Square Enix will be forced to scale back and work on more manageable projects. And you never know, with the emphasis taken off of producing the prettiest games on the market, it may even be able to recapture some of the charm of its older titles (and uglier) titles.